Automotive has had a tough year. Now more than ever do we need insight to understand what motivates consumers to purchase, which brands are being considered, and what impact the digital environment has on the path to purchase. Gustav Goosen, Head of IAB Research Council gives us his take on the automotive industry in South Africa. 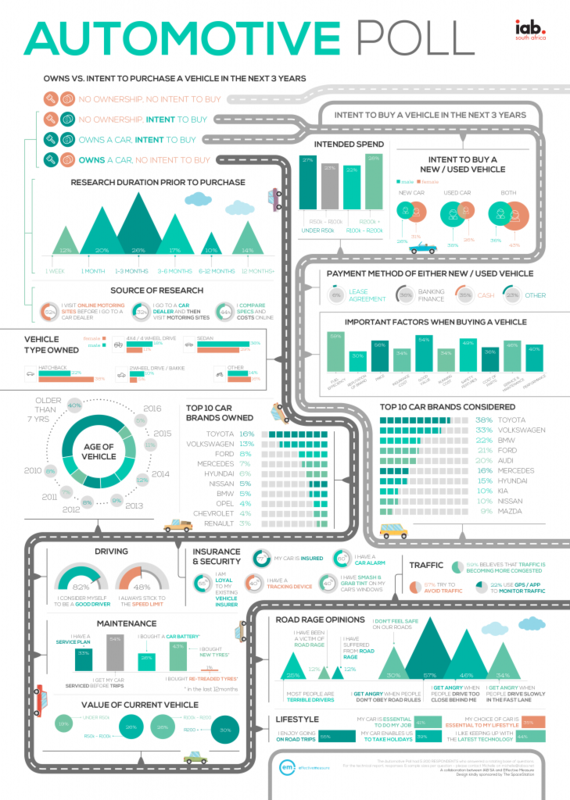 Together with Narratiive, we conducted an automotive-focused poll across our IAB SA publisher base with the aim of extracting exactly this data. We divided the poll the poll into people who have the intent to purchase in the next 3 years and existing car owners. For those with intent to purchase, we asked about key considerations and who their key influencers were in this decision-making process. We also asked about value and the vehicle type being considered. For existing drivers, we asked about safety, maintenance, and attitudes towards driving, and the the impact of owning a car on their lifestyle. Off the bat, it’s interesting to note the extremely high number of respondents – 69% – who either own or intend to purchase a car within the next three years. It was also interesting to observe the extended research period prior to purchase – the majority of respondents (27%) said that they research between 3-12 months, with an additional 14% saying that they spend over 12 months researching which car to buy. This highlights the importance for automotive clients to be present over this extended research period. When it comes to the role of digital in this decision-making period, 52% said they visit online motoring sites before they go to a car dealer. 32% go to a car dealer and then visit motoring sites for additional information. 44% of respondents said that they compare costs and specs online before making their decision. Take a look at the infographic we have created for more top level insights.